This amazing arrangement of flowers is the perfect way to say "I love you!". 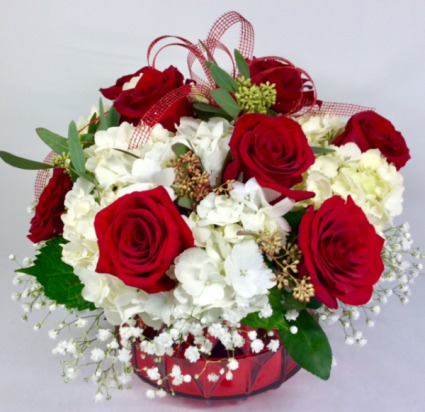 It is in a large red mercury glass bowl and is filled with lush white hydrangeas, babies breath, seeded eucalyptus and our premium red roses. It is accented with a glittery ribbon for that extra special touch! 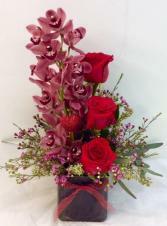 Show your love and appreciation with this purple glass cube filled with a gorgeous cymbidium orchid, premium red roses and super fragrant wax flower. This 4" red glass cube vase is filled with a white Hydrangea, red roses and pink wax flower. The perfect way to say “I love you!”. 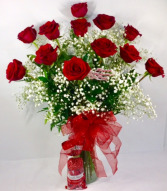 Red roses are the classic gift for Valentine's Day! These are our premium red long stem roses arranged in a glass vase with babies breath. They are accented with a big flashy bow and a "Happy Valentine's Day" pick. As an added bonus, we're including a 7 oz. bag of Russell Stover solid milk chocolate hearts (while supplies last). The upgraded prices are for 18 and 24 roses.